Grown in the high desert regions of the Cederberg Mountains, the shoots of Rooibos have been hand gathered by South Africans for generations. It is prepared like a traditional tea, undergoing meticulous drying (oxidation) and cutting. Organic Red Mellow Bush has an earthy vanilla taste and pleasing orange color with hints of autumn straw. 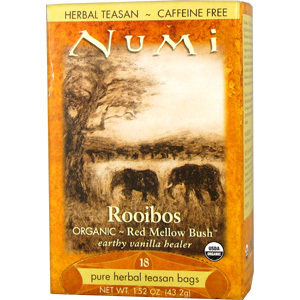 With an anti-oxidant level comparable to green tea, Rooibos has no caffeine, is rich in minerals, very low in tannin, and is relaxing to the nerves. No wonder they call it the miracle tea. 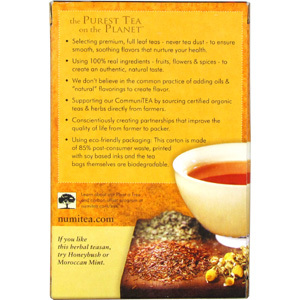 Discover the wonders of Rooibos. 1. What is the difference between white, green, black and oolong tea? Teas are categorized by the drying and oxidation process they undergo. White tea is the least handled- only being plucked and dried. Green tea undergoes a small amount of processing and is then heated to stop oxidization. Oolongs (which cover a wide range of processes) usually have some physical manipulation done to them, breaking down the cellulose within the tea leaf to bring out the flavors. Oxidation is between 10% to 75%. Black teas are fully oxidized. The tea leaf is cut and bruised, bringing out the various flavors nascent in the leaf. 2. 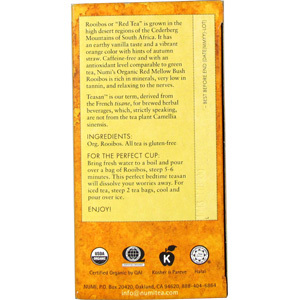 What is Red Tea? 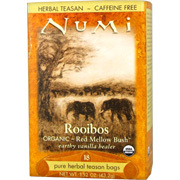 Now commonly referred to as Red Tea, "Rooibos", or "red bush" is a South African herb that is a widely drunk beverage in South Africa and in other countries. 3. What is a Teasan? 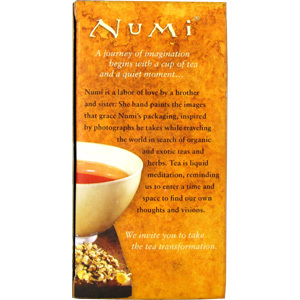 A Teasan is Numi's term for an herbal beverage without tea leaves. It is derived from the French term "tisane". 4. Is it safe to drink your teas and teasans during pregnancy? Although it is recommended to consult your doctor for all nutritional guidance during pregnancy, teasans (herbals) are safe for consumption by pregnant women. 5. Can I use tea to lose weight? Yes. Researchers noted that green tea may work with other chemicals to enhance fat oxidation and thermogenesis, in which the body burns fuel such as fat to produce heat. 6. Does tea have calories? No - simple tea leaves do not contain calories, but when blended with fruits they will possess a small amount of caloric energy potential. 7. I've heard that tea is good for oral hygiene. Is this true? Yes. New York University Dental Center researchers found that regular intake of black tea significantly reduced tooth decay in animals, even when sugar was included in the diet. 8. Is it true that tea is good for women's bone density? Yes. Research shows that female tea drinkers had much stronger bones than non-tea drinkers. Tea drinkers had 5% more bone mineral density at the lumbar spine, indicating a 10% to 20% lower fracture risk. Researchers speculate that isoflavonoid chemicals in tea may have a weak estrogenic effect, reducing bone deterioration and osteoporosis risk. Red Mellow Bush Roobios - is shipped in a discrete, unmarked package. Orders are processed immediately and usually take about 3 to 5 working days to be received. We do ask that you try it for 2 to 3 weeks to feel the full effects. Any information received is used only for order processing and shipping purposes. Your information, such as e-mail address, will never be disclosed to a third party.